Luke Quilter Is Wirehive 100's Digital Leader of The Year! 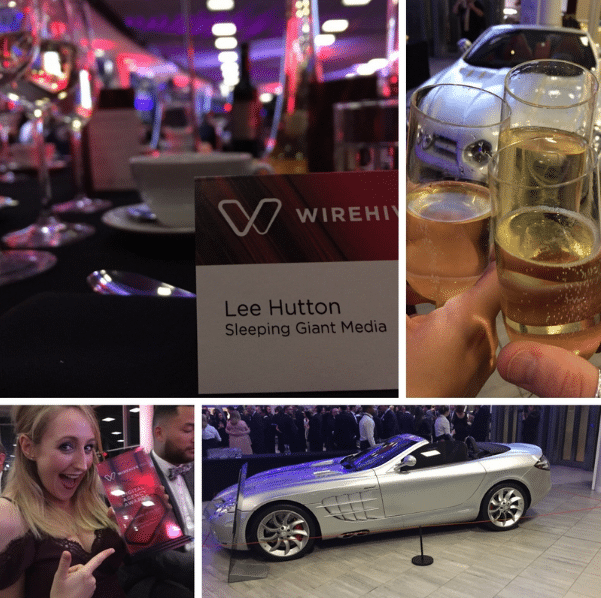 Thursday 13th October saw five of our Giants get their gladrags on to head to the Wirehive 100 Awards. This year the awards celebrated its 5th birthday, with the digital Kings and Queens of the South converging on Mercedes-Benz world in Surrey. The event is all about celebrating and recognising the great agencies doing amazing things in this portion of the country, and what’s not to love about that? Going into the evening we were shortlisted for four awards, including as an agency for the Fastest Growth category. Not only this, but our very own senior search account manager Justine Robson was shortlisted for Account Handler of the Year, Holly Cooke, our senior search account executive, was shortlisted for Techie of the Year, and our CEO, Luke Quilter, who was shortlisted for Digital Leader of the Year. We’re thrilled to announce that our CEO Luke won the Digital Leader of the Year category, and Justine was announced as runner up in the Account Handler of the Year category. Four nominations, 1 runner-up and 1 win is pretty good going we think! Not only did we have a great evening at the awards, but we also found out that we are ranked in the top 20 of the Wirehive 100 agency rankings. Last year we ended up being 26th in the rankings, whereas this year we managed to move all the way up to 17th – a great achievement when you’re up against such great competition in the digital field.